These gifted aerial artists bring stunning live entertainment to any corporate event or private party. 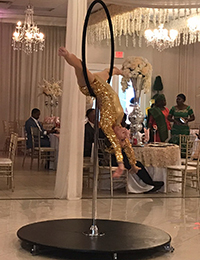 Amaze your guests with a "chandelier bartender" or have them believing in the ability to defy gravity with a silk artist or swing acrobats. Your guests will be treated to talent they won't soon forget. Captivate your audience with the beauty and agility of our aerial ballet artists. Whether they spin, spiral, or interchange classic hoop poses above you, their exquisite entertainment will enthrall your guests with grace, elegance and strength. 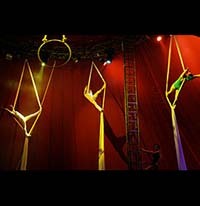 This stunning aerial show is a rare jewel and the perfect accessory to your upcoming corporate event or private party. 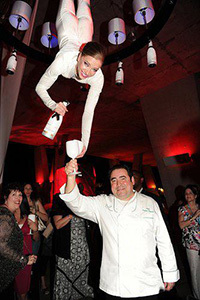 Enjoy this unique form of entertainment as the aerial bartender lights up your next party or event. These artists perform breathtaking aerial acts as they serve champagne or wine. Your guests will be delighted and awed by their technical skill and enthusiastic presentation. These stunning entertainers spiral their bodies in the air, defying gravity and providing your guests with wonder and awe. Whether they fly through the air, strike poses or twist with beautiful silk, they will bring exciting talent to your private party or corporate event.